A life -size reproduction of the original Honour Roll commemorates those from the Keiraville District who served in World War One. The original roll was unveiled on the 4th August 1918 and contained 45 names engraved on a marble slab. 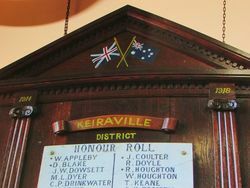 Although the weather was unfavourable, a large number of people assembled at the Mechanics' Institute on Sunday last to witness the unveiling of the Keiraville district Honor Roll. Some time before the scheduled time of starting extra seating accommodation had to be provided. 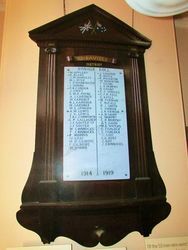 The roll— a marble slab with a handsome frame — contains the names forty-five men, a number of whom have made the supreme sacrifice. 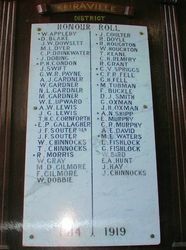 The names were engraved by Mr. R. Dodd, of Wollongong. Mr. William Walker of Keiraville, who designed and made the frame free of charge, deserves great praise, as he has without doubt made one of the best rolls we have seen. The service was opened by the singing of the National Anthem, followed by a short prayer by Mr. Jas. Gardner, then followed the hymn, "O God Our Help in Ages Past;" recitation, Miss Wakeford ; hymn, "Lead Kindly Light," short prayer, Rev. E. Weymouth ; unveiling of Honor Roll by Mr. Hector Lamond, M.H.R., who said he hoped that it would be a silent appeal to all those who were fit and able to take up arms to do so, so that those who had already gone would not be unnecessarily sacrificed. He then unveiled the roll in honor of those who had fallen, and those who still fight for us. Illawarra Mercury (Wollongong, NSW), 9 August 1918.